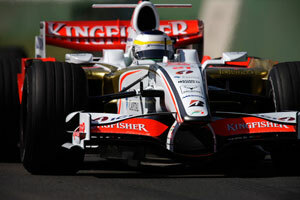 Indian businessman Vijay Mallya bought the Spyker F1 team in the summer of 2007, intent on creating an Indian F1 team. He hired driver Giancarlo Fisichella to partner Adrian Sutil and took on Tonio Liuzzi as the third driver. He also hired new technical staff and began an investment programme designed to take the team back up the grid, to where it had been in the old days of Eddie Jordan.